Ask anyone about the Pacific Princess and chances are they'll tell you that it's the same ship as on 1970s/1980s TV show The Love Boat. Well, that may have been the case a few years ago, but the current Pacific Princess is a completely new ship. Aaron Spelling's old TV star is still cruising (around Spain or Brazil depending on the season), but she hasn't been called "Princess" since 2002 and is now simply called Pacific. 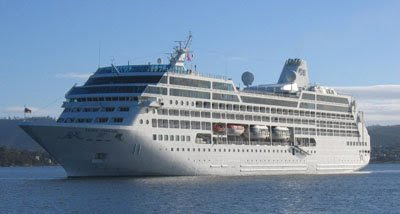 The new Pacific Princess, pictured above, was built in 1999 for Renaissance Cruises and originally called R Three. In late 2001, the entire Renaissance fleet was seized by creditors; she was soon chartered by Pacific Cruises and renamed Pacific Princess. Some stats: The old Princess: 168.8m long and 24.7m beam, 646 passengers (now 780); the new Pacific Princess: 181.00 m long and 25.46 m, 826 passengers. I have cruised on this ship in Fiordland NZ, and it was a very special cruise experience. The ship is perfectly sized! !